Cooking fish can be stressful for beginners. It seems fragile, delicate, it's expensive (at least relative to, say, hamburger), it has bones, it has a face—whatever it is, there's an intimidation factor for sure. And the same is true for learning to grill. So when it comes to grilling fish, it's like a double-whammy. But with this beginner's guide to grilling fish, we'll break down everything you need to know, including prep, tools, tips and basic techniques. It's probably worthwhile to remember that people have been catching fish and cooking them over a hot fire for at least 100,000 years. Not to diss the Neanderthals, but if they could do it, so can you. And the first thing to know is that a clean grill is everything when it comes to grilling fish. Because fish is delicate, and it can stick to your grill, making turning it difficult and leading to all kinds of other problems. And one of the reasons fish will stick is if the grill isn't clean. All those little specks of burnt on crud that might be invisible to a steak or a burger will grab onto your fish the same way the tread on a tire grips the road. So take a few extra moments to thoroughly scrape, brush and oil your grill before putting the fish on it. Of course you should clean your grill anyway. But with fish it's especially critical. Here's more on taking care of your charcoal grill. Your next decision will be what type of fish to grill. Basically any fish can be cooked on a grill, but some varieties and cuts are more forgiving of mistakes and thus preferable for a beginner. These fish have firm flesh that won't fall apart on the grill, and they are available in steaks or thick fillets, which helps them stand up to the high heat of the grill. What you'll want to do is brush the steaks with oil, season them, and grill for 7 to 8 minutes per inch of thickness, turning once halfway through. In other words, for a steak one inch thick, grill for 3 to 4 minutes, turn and grill for another 3 to 4 minutes. And by the way, one inch should be the minimum thickness, especially when you're first learning how to grill fish. The thicker the steak, the more forgiving it will be. A lot of folks get hung up on marinating, like it's going to be the answer to everything, but the reality is that marinade only penetrates a couple of millimeters into the flesh, and if you leave a piece of fish in the marinade too long (like more than 30 minutes), it will start to suffer from unwanted texture changes. You would do just as well to simply dip your fish in the marinade, let any excess drain, and then grill it. Or you could just brush your marinade on while it cooks. One last thing to remember is that you should let your fish come to room temperature before grilling it. That means leave it on the counter for 30 to 60 minutes. That doesn't mean leave it in the sun for 30 to 60 minutes, however. If you're outside, make sure it's covered and in the shade. 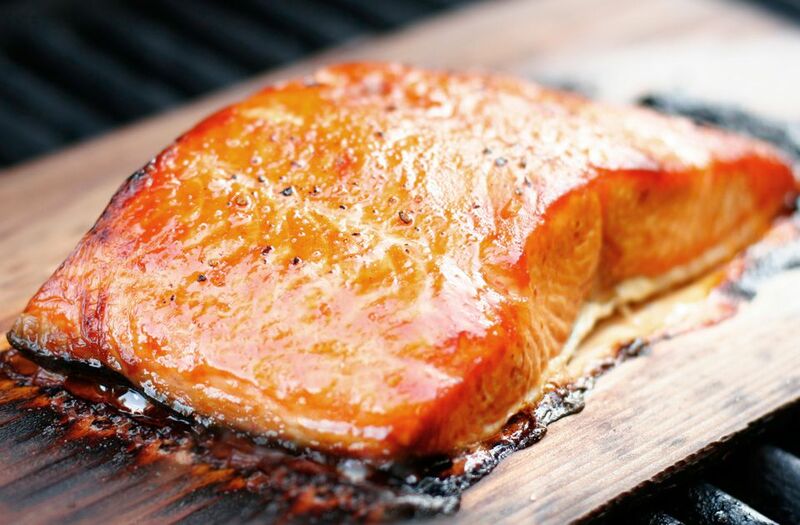 The easiest method of all is to grill your fish on a plank. A plank is simply a slab of wood, usually cedar, but sometimes oak, maple, cherry or apple. After soaking the plank for a couple of hours, simply brush the top with oil, lay it on the hot grill grate and place the fish on top. Cover the grill and cook for about 12 minutes for an inch thick steak (about 50 percent longer than when cooking directly on the grill). You don't even need to turn the fish. One advantage to this technique is that the plank will start to smolder (although it shouldn't actually ignite), which will add a wonderful smoky flavor to the fish that you can't obtain when grilling directly on the grate. And you can use a plank on a gas or charcoal grill. Here's more about grilling fish on a plank. Not flake too easily: Many recipes say that fish is done when it flakes easily, but this is actually the point at which fish is overcooked. Instead, strive to remove the fish from the grill when it just starts to flake, not when it flakes easily. Marinate briefly: Marinating longer than 30 minutes not only has no added benefit, it can also degrade the quality of the fish. Leave the skin on: The skin will not only turn crispy, it will also protect the fish from overcooking. Fillets should start skin side down and then turn them halfway through. Steaks will have skin on the edges. Grilling whole fish: When you're ready to step up to grilling a whole fish (like trout, snapper, sea bass), stuff it with herbs and citrus and tie it closed with butcher's twine. A plank works wonderfully for whole fish too.